Of all of the tools we use, the most important are our paint brushes. As you get more into painting you’ll want to invest in good brushes. I use Winsor & Newton Series 7 brushes while Goatboy uses Raphael Series 8404 brushes. Most of us buy these on the Internet at a discount but they still represent a decent investment in our tools. As with any tool proper care will ensure a long life with lots of use. 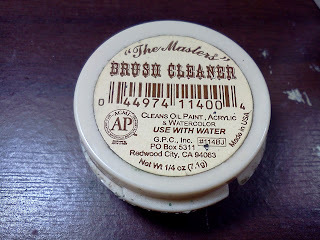 At the end of any painting session you’ll want to give your brush a thorough cleaning with clean water and brush soap. The brush soap I recommend for regular cleaning is the Masters Brush Soap. This soap comes as a cake of soap in a plastic container. 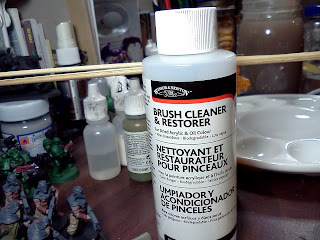 The nice thing about this soap is that it quickly removes the light pigments that build up in the bristles as you paint. It always surprises me how much color this soap removes from the brush even after I think I’ve completely rinsed the brush out. Over time small amounts of paint will find its way up into the ferrule of you brush. These little deposits will hinder your brush from maintaining a decent point. When your brush has reached this point you can resurrect the point. 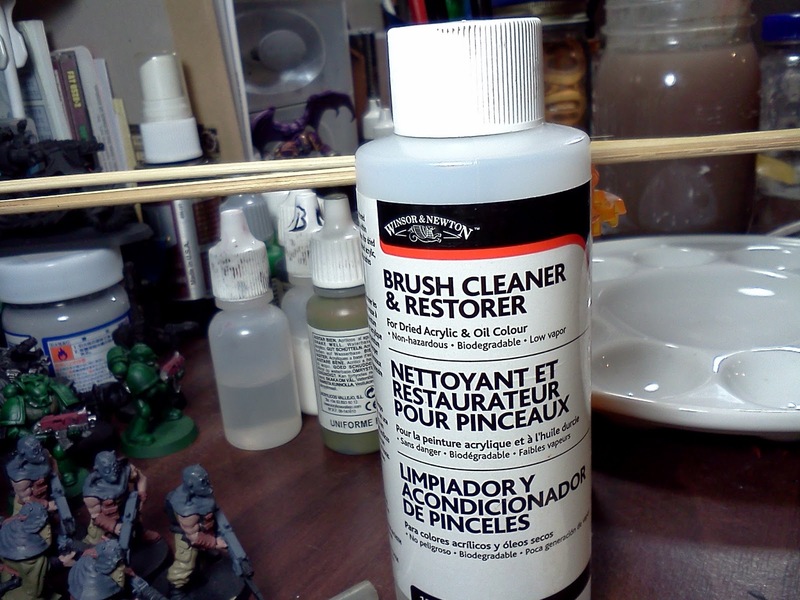 Winsor & Newton Brush Cleaner and Restorer is the tool for this job. There are brush rinsing pots for soaking your brushes in but pay for something that is easy to make? 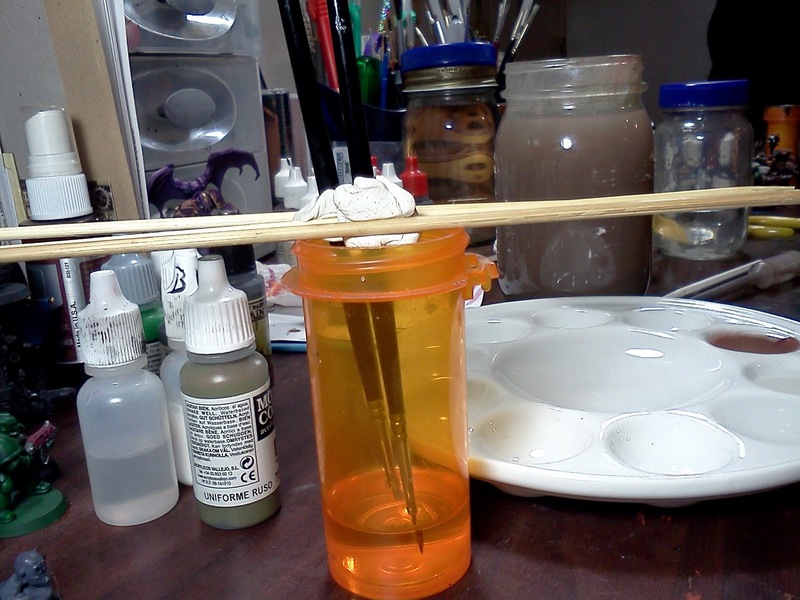 All you need is two bamboo skewers, a pill bottle, and some poster tack. Now once you set up your rig add the brush cleaner to go above the ferule. From here on out just follow the directions on the bottle of Brush Cleaner, and your brush will be back in pro form in no time. How do you keep your brushes in top form? As always leave your thoughts in the comments. It is time for another game system review by yours truly. 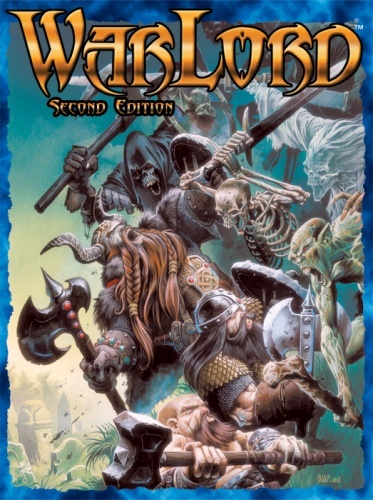 Warlord is Reaper Miniature’s fantasy wargame. It is a skirmish level game set in a high fantasy realm that looks like it could be a D&D campaign realm with all the usual trappings. So let’s look at this game. Both players bring forces of a predetermined point size with 1000 points being the recommended size. These forces are chosen from 18 factions that are found in two books and one online faction. 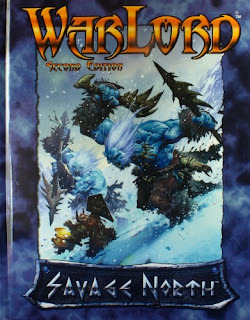 Both books contain the core rules, so you will only need to buy the book containing the faction you want to play. From these factions you construct your army. Armies are broken down into individual troops. Each troop is made up of a leader, basic troops of varying ability, and sometimes an elite model. Some troops can also consist of one model and these single model troops are usually powerful monsters or heroes. The game is played on a 48”x48” table. It is played with a 10 sided die. Terrain can be as abundant as you wish, and the terrain rules are more abstracted, i.e. no true line of site. Before the start of the game, players will need to create an initiative deck. An initiative deck is smaller deck of cards created by using a standard playing card deck of 52 cards. Each player chooses a suit (color is best) and a card is added to the initiative deck for every troop a player has. Certain game rules allow for more or less cards to adjust the size of the deck. Each game turn has three distinct phases: initiative, action, and end. The initiative phase is where the top card of the initiative deck is turned over. The suit that is showing indicates which player may activate a single troop. The player then conducts actions for that troop. After which the players flip over the next card on top of the initiative deck and repeat the process. It is possible that a player may activate several troops in a row before their opponent does. The action phase is where troops do things. Every model can make two actions. There is no set order of actions, so models can charge and then fight or they can fight and then move off. This no set order of actions gives a player some tactical flexibility. The actions are grouped by movement, combat, specialty and free actions. The game has two types of victory conditions which players must agree upon at the start of the game. Wipeout your opponent is one. The other is play to turn 5, calculate points of what is left on the table, and the player who has more points left wins. This isn’t to say players can’t design their own scenarios or victory conditions, but those are the two conditions provided in the book. Overall I like this game. I think it provides both a beer & pretzels sort of feel while also allowing for some nice tactical depth. Although there are synergies in this game many of the tactics are based around timing actions correctly, which I am a bigger fan of. I really like the flexibility of turn actions, and the intermixed player activations. I think it’s a game worth trying especially if you enjoyed Mordheim. So what are you’re thoughts on fantasy skirmish games? If you’re in Austin, TX on April 14th at 7:00 PM I’ll be running a Warlord demo at Dragon’s Lair. Stop on in, say hi, and roll some dice with me. 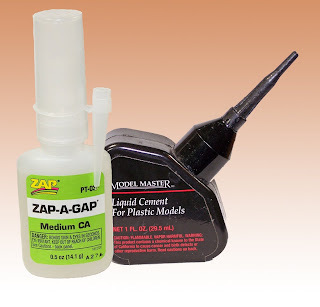 For the miniature enthusiast there are three types of glue they are familiar with. The most common and most widely used is cyanoacrylate or CA glue. Its more common name is super glue. The other two glues that are used are plastic cement and epoxy. All three have their place in the hobbyist’s arsenal, and this is why I am going to take a closer look at them. Cyanoacrylate is an acrylic resin adhesive that utilizes water as a hardener. It doesn’t shrink and it can bond two dissimilar surfaces together. The main benefits are fast drying times, and relative decent bonds. Its drawbacks are that certain plastics and non-porous materials may make it difficult for the give to form bonds. Also the glue, when fully hardened is brittle, which may cause breakage. Now that we know what CA glue is let’s look at using its properties to help us. CA glue is the workhorse glue of the wargamer’s universe. The primary reason is because one can assemble an army in a relative short period of time. Also with a little effort you can cause the glue bond to fail, which means you can easily change out model configurations with edition or codex changes. The drawbacks to this glue mean overtime your tabletop figures will break because of stresses from handling and transport. Epoxy is the least used of all the glues. It is a two part process consisting of a resin and a hardener. It has a longer drying time than CA glue, which can be advantageous. It has a stronger bond than CA, and it doesn’t suffer from shrinkage like water based glues. Once it is fully hardened it can be sanded and drilled. Since epoxy is the red headed step child of the modeling world I thought I would explain why you should use it. Its best use is with large multi piece models, and resin kits because it makes strong bonds that will support the weight of your figure. 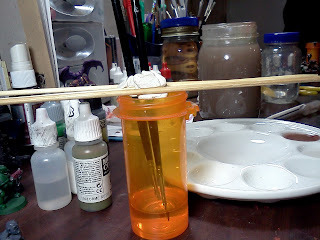 Because it takes longer to harden, you can also quickly clean up any glue mess that should occur on your figure. It will also help fill gaps. The increased hardening time does mean that you will need to get comfortable to hold the pieces in position, or if you can work it out a hobby vise or a third hand tool will work just fine. Finally, there is our good old standby plastic cement. (As a word of caution the warnings on the bottles about the fumes being flammable and harmful are spot on. The reason why you get the “high” sensation is because your brain is suffering hypoxia or lack of oxygen. This can kill you, so please use your plastic glue in well ventilated area.) Plastic glue is unlike our other two glues in that it is not a resin but a solvent. It works by dissolving and softening the plastic molecules, and after a few minutes to twenty four hours the two pieces of plastic are literally welded together. Many wargamers avoid plastic glue because many of their projects utilize plastic and metal parts, or they like the abilty to pop apart old models to redo for newer codices. Plastic Cement comes in many varieties. The most commonly known is the Testors Plastic Cement in a tube. This is thicker of the plastic cements and has a gel like consistency. Gel cements can take several minutes to set and then a minimum of 24 hours to cure. Gel cements give you an amount of working time much like epoxy. That way you can get your join in the exact position you want. On the other end of the spectrum you have plastic glues that are almost like water. Plastic Weld is one that comes to mind. It has a set time of a few seconds and will reach full cure in minutes. My preferred glue of choice is Testors Model Master Model Cement. It comes in a black triangular bottle and is more liquid like. It is more workable than Plastic Weld but will set quicker than the tube glue. The bottle recommends a full 24 hours to cure, but I’ve slapped paint down after only two hours. I am fan of the plastic cements because not only does it glue, but it also fills gaps. Glue of any type is incredibly based on what your personal tastes. 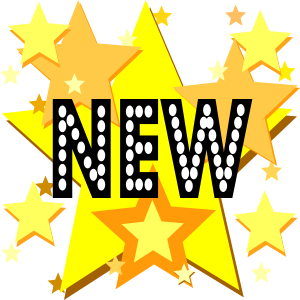 I have provided this more to help beginners and veterans gain a better understanding of the tools available to them and that there are options available. So what glue do you use the most, and do you have any gluing tips you would like to share with the community? Look what showed up late last night. Reaper just announced they will be producing the official miniatures for Savage Worlds. I'm excited to see where this goes. For the full details you can read the story here.